This past weekend I rode a mechanical bull for the first time. I was out for one of the first times since the baby, at a bachelorette party, my cousin had brought shorts to wear under our dresses and I was feeling good after my 1.5 skinny girl margaritas so I said -- Why Not? It was a blast and a good workout -- my thighs still hurt two days later. When else am I going to ride the bull? I'm certainly not taking Cam there in his Baby Bjorn! I doubt I will go back to that bar anytime soon, so bull riding is not going to become a habit, but I'm glad I did it...I may be a 30 year old new mom, but I haven't lost my sassy side. Speaking of sassy -- one of my favorite actors -- Neil Patrick Harris -- is going to be a dad! 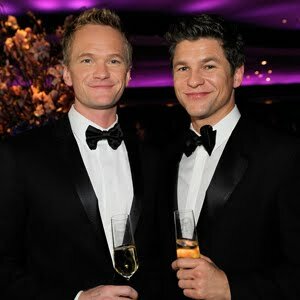 He and his longtime partner David Burtka are expecting twins via surrogate this fall. How exciting! I loved Doogie Howser, M.D. and I love him in How I Met Your Mother -- oh, and did anyone see his guest appearance on Glee? Very talented guy and I bet he will be a great dad. Surrogacy is such an amazing miracle -- to think that without surrogates, many people may never be parents. Last week Jennifer Aniston took heat from Bill O'Reilly for comments she made while doing press for her new movie, The Switch. In The Switch Jennifer plays a woman who uses artificial insemination to become a mother on her own. During a press conference Jennifer said: "Women are realizing it more and more, knowing that they don't have to settle with a man just to have that child...Love is love and family is what is around you and who is in your immediate sphere." O'Reilly commented on her quote on his show calling her words "destructive to our society." Wow. Really? Destructive to our society? That seems a little ridiculous. Jennifer is saying that there is more than one way to have a family and to raise a child. I don't think that loving a child and surrounding that child with others that love him or her is destructive. Not every family is a mom and dad -- some are mom and mom or dad and dad -- and MANY families in this country are just mom because the dad left. What destroys our society most? Disrespect of others. Oh, and wasn't Bill O'Reilly accused of sexual harassment?